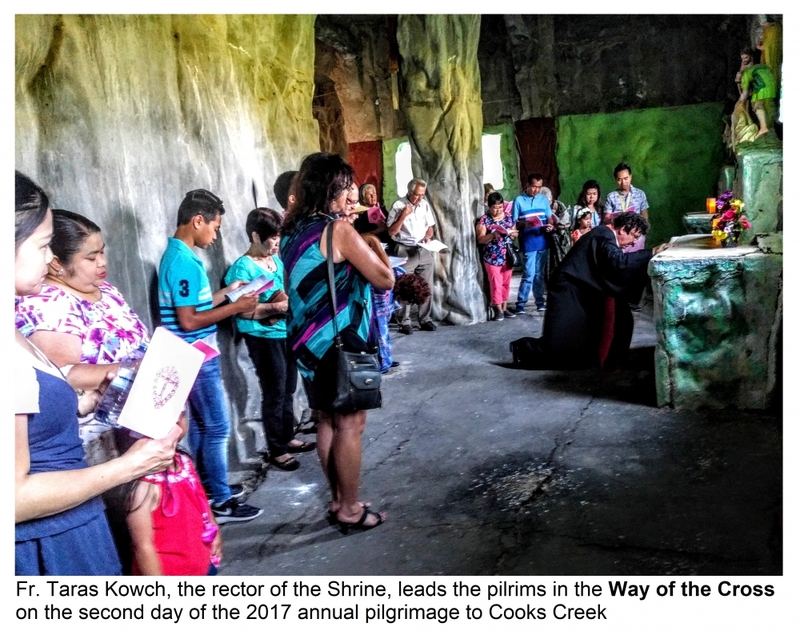 The annual Dormition Marian Pilgrimage a Cooks Creek, Manitoba proved once again to be an experience of grace for those that made the trip 25 minutes northeast from Winnipeg. The typical schedule was followed that saw a series of spiritual events spread over a three-day weekend. On Friday evening, the Archeparchial branch of the Ukrainian Catholic Women’s League of Canada, together with representatives from many UCWLC branches, hosted the praying of the Rosary at the grotto. This was followed immediately with the celebration of the Divine Liturgy at which Fr. John Mostivsky of Holy Family Parish was the main celebrant and the homilist. As during every day of the pilgrimage, the opportunity for the sacrament of Penance was available throughout the evening. Traditionally associated with the feast of the Dormition (Assumption), there was a blessing of water and flowers each day. This was invariably followed by an anointing for healing. The anointing was very popular as many came forward to receive a blessing for whatever spiritual, emotional and physical challenge that they brought before the Lord. Each day there was also a fellowship component where food and refreshments prepared by the parish was available and ample time for sharing and singing and just chatting. On Saturday evening one of the highlights was the Way of the Cross that was conducted by the rector of the Shrine, Fr. Taras Kowch. He led the group of pilgrims around the 14 stations of the Cross that are found in the “far caves” around the grotto complex. 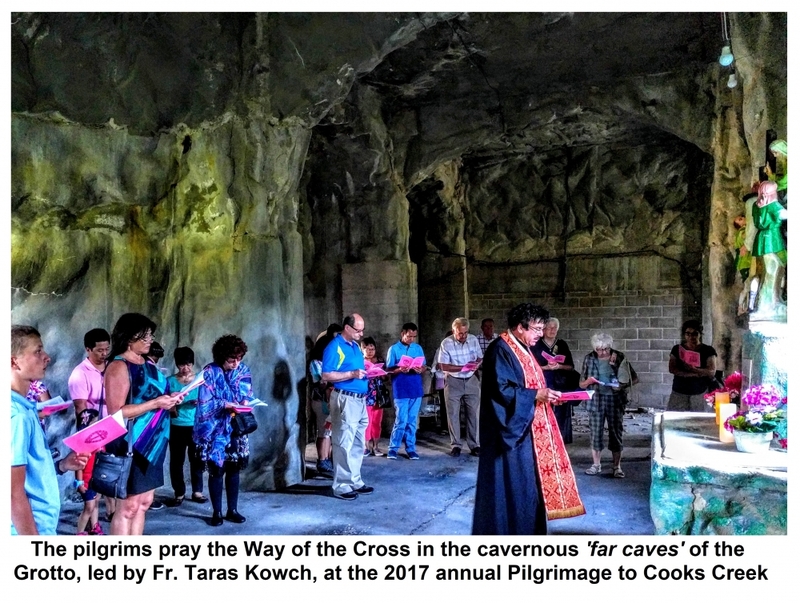 Sometimes these stations of the Cross are missed by pilgrims that are not aware that beside the “near caves” that are seen beyond the altar, there is another truly cavernous passageway around the back of the Grotto. They will remind anyone that has made a pilgrimage to Rome of the catacombs where the early Christians gathered, prayed, sometimes were martyred and were buried by the thousands. It was truly a meditative experience as the crowd made its way through the sometimes-dark passageway with Fr. Taras introducing each Station and everyone responding in prayer and song. Following this, the usual program took place. The Eucharistic liturgy was celebrated by Fr. Taras and he preached the homily during which he very much tied this Lourdes Grotto to the world-renowned Lourdes Grotto in France. He told the story of one of the most famous miracles at Lourdes as an example of how the Mother of God truly interce des for those who turn to her for help. On Sunday morning, the symbolic yet very inspiring 4-mile walking pilgrimage was made in the area of the Shrine and returning to the Grotto before the first service took place. A mixed group of pilgrims of all ages made their way along country roads, praying the Rosary, singing hymns and enjoying moments of quiet meditation. Shortly after they returned to the Shrine, a memorial service (panakhyda) was held on the nearby cemetery for Fr. Philip Ruh, OMI the missionary priest that initiated the shrine, but died before it was fully built (It was later completed by the Knights of Columbus). The Archbishop of Winnipeg, Metropolitan Lawrence Huculak, led the concluding Divine Liturgy at the outdoor altar at the Grotto. He was assisted by other clergy, some of who heard confessions for much of the morning, and the local choir beautifully sang the responses. The Metropolitan preached at the Liturgy and also performed the traditional blessing of the flowers. The concluding festal anointing (myrovannya), also a tradition on more major feast days, again, became more of an ‘anointing for healing’ for which practically everyone came forward. The day ended with an amazing dinner prepared by the parishioners of the Shrine Parish of the Immaculate Conception at Cooks Creek. It is not surprising that some of the conversation at the table was about… next year’s annual Pilgrimage and how it may be enhanced to be an even more wonderful experience….